Tires are designed with certain road conditions in mind. 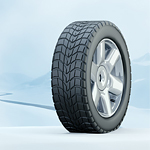 The quality of rubber on a snow tire is designed for cold and moisture. The tread is much thicker so you can grip the road properly. A summer tire tends to have a much lower profile of tread.